1. The Generality of DNA-Templated Synthesis as a Basis for Evolving Non-Natural Small Molecules. Gartner, Z. J. and Liu, D. R. J. Am. Chem. Soc. 123, 6961-6963 (2001). PDF | Supplemental info A highlight describing this work appears in Angew. Chem. Int. Ed. 41, 89-90 (2002). PDF This work reports the generality of DNA-templated synthesis, its distance independence, and a model translation of multiple DNA sequences into corresponding synthetic products in a manner suitable for in vitro selection and PCR amplification of templates encoding desired synthetic molecules. 2. An In Vivo Selection System for Homing Endonuclease Activity. Gruen, M.; Chang, K.; Serbanescu, I.; Liu, D. R. Nucleic Acids Res. 30, e29 (2002). PDF This paper describes a selection system that is the basis of ongoing efforts to evolve and understand homing endonucleases with novel substrate specificities. 3. Recent Advances in the In Vitro Evolution of Nucleic Acids. 4. Expanding the Reaction Scope of DNA-Templated Synthesis. Gartner, Z, J.; Kanan, M. W.; Liu, D. R. Angew. Chem. Int. Ed., 41, 1796-1800 (2002). PDF This work is featured in an online Nature Science Update. This paper reveals the potential of DNA to direct a wide range of synthetic organic reactions by reporting many new DNA-templated chemistries, including the first general carbon-carbon bond forming reactions (nitro-aldol, nitro-Michael, dipolar cycloadditions, Wittig olefinations, and Pd-mediated cross-couplings) templated by nucleic acids. 5. Nucleic Acid Evolution and Minimization by Nonhomologous Random Recombination. Bittker, J. 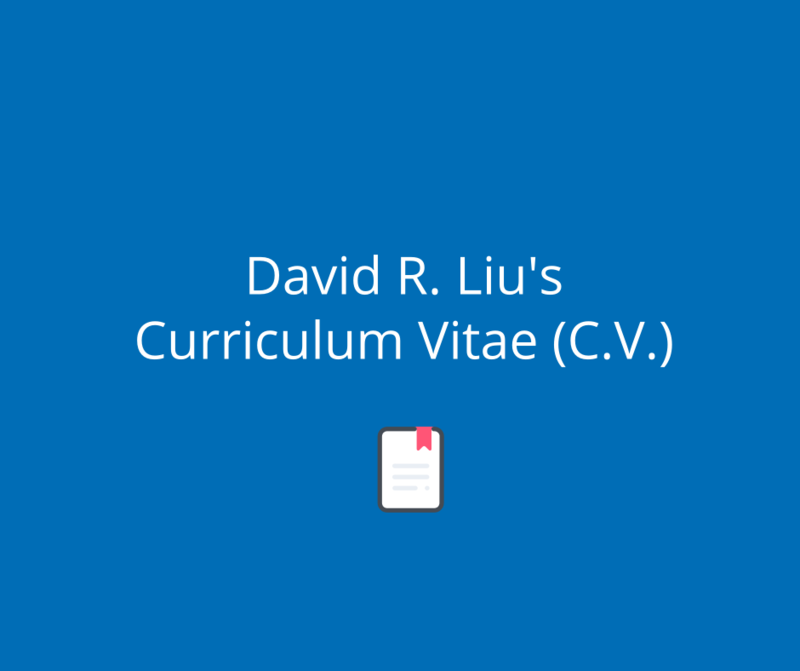 A.; Le, B. V.; Liu, D. R. Nat. Biotechnol. 20, 1024-1029 (2002). PDF This work describes a new method (NRR) for the diversification of nucleic acids that allows random recombination to take place between multiple unrelated DNA sequences, and demonstrates that NRR enables nucleic acid evolution, functional dissection, and minimization in ways not possible using existing diversification methods. 6. Multistep Small-Molecule Synthesis Programmed by DNA Templates. Gartner, Z. J.; Kanan, M. W.; Liu, D. R. J. Am. Chem. Soc., 124, 10304-10306 (2002). PDF | Supplemental info News stories describing this work appear in Chem. & Eng. News 80  12 (2002) PDF, and in Science, 300, 242 (2003). This paper describes the development of linker and purification strategies that enable the products of DNA-templated reactions to serve as starting materials for subsequent DNA-templated transformations. These findings enable DNA sequences to be translated into structures of useful complexity. 7. Directing Otherwise Incompatible Reactions in a Single Solution Using DNA-Templated Organic Synthesis. Calderone, C. T.; Puckett, J. W.; Gartner, Z. J.; Liu, D. R. Angew. Chem. Int. Ed. 41, 4104-4108 (2002). PDF This work is featured as an Editor’s Choice in Science 298 , 1517 (2002). This paper describes a new mode of controlling reactivity in a DNA-templated format that is not possible using conventional synthesis approaches. 8. Two Enabling Architectures for DNA-Templated Organic Synthesis. Gartner, Z. J.; Grubina, R.; Calderone, C. T.; Liu, D. R. Angew. Chem. Int. Ed. 42, 1370-1375 (2003). PDF A Science and Technology Concentrate describing this work appears in Chem. & Eng. News 81  24 (2003). PDF This paper reports the development of two template architectures (omega and T) that expand the types of reactions that can be performed in a DNA-templated format. 9. In Vivo Evolution of an RNA Transcriptional Activator. Buskirk, A. R.; Kehayova, P. D.; Landrigan, A.; Liu, D. R. Chem. Biol. 10, 533-540 (2003). PDF This paper is noted as an article of interest in Cell 113 (7) and is previewed in a separate article in Chem. Biol. 10, 584-585 (2003). This work describes the evolution from random RNA libraries expressed in yeast cells of a short RNA sequence that strongly activates gene transcription. The potency of this RNA rivals that of the most active known natural transcriptional activators (all of which are proteins). Its function was dissected using a combination of site-directed mutagenesis, additional evolution, and secondary structure prediction. 10. Stereoselectivity in DNA-Templated Organic Synthesis and Its Origins. Li, X. and Liu, D. R. J. Am. Chem. Soc. 125, 10188-10189 (2003). PDF | Supplemental info This paper reports the ability of DNA templates to induce stereoselectivity in DNA-templated reactions and traces the origins of this stereoselectivity to the macromolecular conformation of the DNA templates. These findings reveal the conditions under which DNA templates can perturb reaction outcomes beyond simple modulation of effective molarity. 11. Highly Sensitive In Vitro Selections for DNA-Linked Synthetic Small Molecules with Protein Binding Affinity and Specificity. Doyon, J. B.; Snyder, T. M.; Liu, D. R. J. Am. Chem. Soc. 125, 12372-12373 (2003). PDF | Supplemental info This work describes the development of affinity and specificity selections for DNA-linked synthetic molecules such as those emerging from DNA-templated small molecule library synthesis. 12. Efficient and Sequence-Specific DNA-Templated Polymerization of PNA Aldehydes. 13. Expanding the Genetic Code In Vitro and In Vivo. Magliery, T. J.; Liu, D. R. The Genetic Code and the Origin of Life Ed. Ribas de Pouplana, L. Landes Bioscience and Springer, (2004). 14. Translation of DNA into Synthetic N-Acyloxazolidines. Li, X.; Gartner, Z. J.; Tse, B. N.; Liu, D. R. J. Am. Chem. Soc. 126, 5090-5092 (2004). PDF | Supplemental info Multistep DNA-templated synthesis was used to generate N-acyloxazolidines and macrocyclic N-acyloxazolidines. These structures represent the most complex synthetic small molecules to date translated from DNA. 15. DNA-Templated Organic Synthesis: Nature’s Strategy for Controlling Chemical Reactivity Applied to Synthetic Molecules. Li, X.; Liu, D. R. Angew. Chem. Int. Ed. 43, 4848-4870 (2004). PDF This article reviews the growth of DNA-templated synthesis from its origins as a model system for self-replication to its recent development into a general way to control the reactivity of synthetic molecules using effective molarity. 16. Directed Evolution of Protein Enzymes Using Nonhomologous Random Recombination. Bittker, J. A.; Le, B. V.; Liu, J. M.; Liu, D. R. Proc. Natl. Acad. Sci. USA 101, 7011-7016 (2004). PDF The development and use of protein nonhomologous random recombination (protein NRR) to evolve active chorismate mutase protein enzymes with rearranged secondary structures are described in this work. 17. Engineering a Ligand-Dependent RNA Transcriptional Activator. Buskirk, A. R.; Landrigan, A.; Liu, D. R. Chem. Biol. 11, 1157-1163 (2004). PDF This work is featured in a Research Highlight in Nat. Methods 1, 6-7 (2004). PDF This paper reports the use of RNA engineering and directed evolution methods to create an RNA-based transcriptional activator that is regulated by a cell-permeable synthetic small molecule. 18. Directed Evolution of Ligand Dependence: Small Molecule-Dependent Protein Splicing. Buskirk, A. R.; Ong, Y.-C.; Gartner, Z. J.; Liu, D. R. Proc. Natl. Acad. Sci. USA 101, 10505-10510 (2004). PDF The laboratory evolution of an intein that undergoes splicing only in the presence of a cell-permeable synthetic small molecule is described in this work. The evolved intein was used in living cells to render the function of four unrelated proteins dependent on the small molecule in a post-translational and dose-dependent manner. 19. DNA-Templated Organic Synthesis and Selection of a Library of Macrocycles. Gartner, Z. J.; Tse, B. N.; Grubina, R.; Doyon, J. B.; Snyder, T. M.; Liu, D. R. Science 305, 1601-1605 (2004). PDF | Supplemental info This work is featured as a Research Highlight in Nat. Biotechnol. 22, 1247 (2004). This paper describes the translation of a single-solution library of DNA templates into a library of corresponding synthetic small-molecule macrocycles, the in vitro selection of a single member of the DNA-templated library for its protein binding activity, and the amplification by PCR of the DNA encoding the active macrocycle. 20. Reaction Discovery Enabled by DNA-Templated Synthesis and In Vitro Selection. Kanan, M. W.; Rozenman, M. M.; Sakurai, K.; Snyder, T. M., Liu, D. R. Nature 431, 545-549 (2004). PDF | Supplemental info This work is featured in a news focus article in Science 305, 1558 (2004) PDF, in a Science and Technology Concentrate in Chem. & Eng. News 82  31 (2004) PDF, and in a News and Views commentary in Nat. Biotechnol. 22, 1378-1379(2004) PDF. Here we report a new approach to reaction discovery that simultaneously evaluates many combinations of substrates in a single solution for bond-forming reactivity. Using this approach, we discovered an efficient and mild alkyne-alkene coupling reaction catalyzed by an inorganic Pd(II) salt that generates a trans-enone. 21. Nucleic Acid-Templated Synthesis as a Model System for Ancient Translation. 22. In Vitro Characterization of IroB, a Pathogen-Associated C-Glycosyltransferase. 23. Creating Small Molecule-Dependent Switches to Modulate Biological Functions. 24. DNA-Templated Functional Group Transformations Enable Sequence-Programmed Synthesis Using Small-Molecule Reagents. 25. Functional Dissection of sRNA Translational Regulators Using Nonhomologous Random Recombination and In Vivo Selection. 26. In Vitro Characterization of Salmochelin and Enterobactin Trilactone Hydrolases IroD, IroE, and Fes. 27. Ordered Multistep Synthesis in a Single Solution Directed by DNA Templates. 28. Small-Molecule Diversification From Iterated Branching Reaction Pathways Enabled by DNA-Templated Synthesis. 29. DNA-Templated Synthesis in Organic Solvents. 30. Enzymatic Tailoring of the Bacterial Siderophore Enterobactin Alters Membrane Partitioning and Iron Acquistion. 31. Directed Evolution and Substrate Specificity Profile of Homing Endonuclease I-SceI. 32. How Pathogenic Bacteria Evade Mammalian Sabotage in the Battle for Iron. 33. A Protein Interaction Surface in Nonribosomal Peptide Synthesis Mapped by Combinatorial Mutagenesis and Selection. 34. Control of Transcription Factor Activity and Osteoblast Differentiation in Mammalian Cells Using an Evolved Small-Molecule-Dependent Intein. Yuen, C. M.; Rodda, S. J.; Vokes, S. A.; McMahon, A. P.; Liu, D. R. J. Am. Chem. Soc. 128, 8939-8946 (2006). PDF. This work is featured in a Science and Technology Concentrate in Chem. & Eng. News 84 , 34 (2006), as a Spotlight in ACS Chem. Biol. 1, 328 (2006), and as a News and Views article in Nature 442, 517-518 (2006). 35. Bromoenterobactins as Potent Inhibitors of a Pathogen-Associated, Siderophore-Modifying C-Glycosyltransferase. 36. Localized Protein Interaction Surfaces on the EntB Carrier Protein Revealed by Combinatorial Mutagenesis and Selection. 37. Binding and Stability Determinants of the PPARγ Nuclear Receptor/Coactivator Interface as Revealed by Shotgun Alanine Scanning and In Vivo Selection. 38. The Pathogen-Associated iroA Gene Cluster Mediates Bacterial Evasion of Lipocalin 2. 39. In Vivo Evolution of an RNA-Based Transcriptional Silencing Domain in S. cerevisiae. 40. Synthesis of Acyclic α,β-Unsaturated Ketones via Pd(II)-Catalyzed Intermolecular Reaction of Alkynamides and Alkenes. 41. Solving Chemical Problems through the Application of Evolutionary Principles. 42. Directed Evolution Can Rapidly Improve the Activity of Chimeric Assembly-Line Enzymes. 43. Supercharging Proteins Can Impart Extraordinary Resilience. 44. Identification of Eukaryotic Promoter Regulatory Elements Using Nonhomologous Random Recombination. 45. Dissecting Protein Structure and Function using Directed Evolution. 46. Discovery of a mRNA Mitochondrial Localization Element in Saccharomyces cerevisiae by Nonhomologous Random Recombination and In Vivo Selection. 47. Development and Initial Application of a Hybridization-Independent, DNA-Encoded Reaction Discovery System Compatible with Organic Solvents. This work is featured in a Science and Technology Concentrate in Chem. & Eng. News 85 (47), 43. 48. Effects of Template Sequence and Secondary Structure on DNA-Templated Reactivity. 49. DNA-Templated Polymerization of Side-Chain-Functionalized Peptide Nucleic Acid Aldehydes. 50. Translation of DNA into a Library of 13,000 Synthetic Small-Molecule Macrocycles Suitable for In Vitro Selection. 51. Recent Progress Towards the Templated Synthesis and Directed Evolution of Sequence-Defined Synthetic Polymers. 53. A Chemical Screen for Biological Small Molecule-RNA Conjugates Reveals CoA-Linked RNA. Kowtoniuk, W. E.; Shen, Y.; Heemstra, J. M.; Agarwal, I.; Liu, D. R. Proc. Natl. Acad. Sci. USA 106, 7768-7773 (2009). PDF | Supplemental Info This work was featured in a news story in Chemistry World (PDF) (April 20, 2009), in a news story in Chem. & Eng. News 87 9 (2009) PDF, in a Research Highlight in Nat. Chem. Biol. 5, 380-381 (2009) PDF, and in a Highlight in ChemBioChem 10, 2145-2146 (2009). 54. Conversion of 5-Methylcytosine to 5-Hydroxymethylcytosine in Mammalian DNA by the MLL Fusion Partner, TET1. Tahiliani, M.; Koh, K. P.; Shen, Y.; Pastor, W. A.; Bandukwala, H.; Brudno, Y.; Agarwal, S.; Iyer, L. M.; Liu, D. R.; Aravind, L.; Rao, A. Science 324, 930-935 (2009). PDF | Supplemental Info. This work was featured in a Spotlight in ACS Chem. Biol. 4, 315 (2009) PDF, in a Research Highlight in Nature 458, 1080 (2009) PDF , and in a Cover Story in C&E News 87 , 11 (2009). 55. Reactivity-Dependent PCR: Direct, Solution-Phase In Vitro Selection for Bond Formation. Brudno, Y.; Birnbaum, M. E.; Kleiner, R. E.; Liu, D. R. Nat. Chem. Biol. 6, 148-155 (2010) PDF | Supplemental Information. This work was featured in a News and Views article in Nat. Chem. Biol. 6, 87-88 (2010) PDF, and was also featured in an article highlighting Nat. Chem. Biol. papers over the five-year history of the journal in Nat. Chem. Biol. 6, 387-389 (2010) PDF. He, Y. and Liu, D. R. Nat. Nanotechnol. 5, 778-782 (2010). PDF | Supplemental Information. This work was featured in a news story in Chemistry World (October 10, 2010) PDF in a News and Views article in Nat. Nanotechnol. 5, 760-761 (2010) PDF, and in a Research Highlight in Nat. Methods 7, 952 (2010) PDF. Chen, I.; Dorr, B. M.; Liu, D. R. Proc. Natl. Acad. Sci. USA 108 (28), 11399-11404 (2011).PDF. This work was highlighted in a technology feature in Nat. Methods 8, 623 (2011). Pattanayak, V.; Ramirez, C. L.; Joung, J. K.; Liu, D. R. Nat. Methods 8, 765-770 (2011).PDF. This work was featured in a news story in the August 7, 2011 issue of Nature, in a Highlight in Nat. Genet., in a news story in C&E News, 89 , 8 (2011), in a news story in the August 7, 2011 issue of The Scientist, in a News and Views article in Nat. Methods 8, 725 (2011), and as a news story in the August 10, 2011 issue of BioWorld Today. Dumelin, C. E.; Chen, Y.; Leconte, A. M.; Chen, Y. G.; Liu, D. R. Nat. Chem. Biol. 8 (11), 913-919 (2012).PDF. This work was featured in a Science and Technology Concentrate in C&E News and in Nat. Rev. Microbiol. 10, 731 (2012). Hili, R.; Niu, J.; Liu, D. R. J. Am. Chem. Soc 135, 98-101 (2013). PDF. This work was featured in a Spotlight in J. Am. Chem. Soc. 135, 1627 (2013). Pattanayak, V.; Lin, S.; Guilinger, J. P.; Ma, E.; Doudna, J. A.; Liu, D. R. Nat. Biotechnol. 31, 839-843 (2013).PDF This work was featured in a News & Views article in Nat. Biotechnol. 31, 807-809 (2013). McGregor, L. M.; Liu, D. R. In A Handbook for DNA-Encoded Chemistry: Theory and Applications for Exploring Chemical Space and Drug Discovery. Goodnow, R.A., Ed. ; Wiley: Hoboken pp. 377-415 (2014). Maianti, J. P.; McFedries, A.; Foda, Z. H.; Kleiner, R. E.; Du, X.-Q. ; Leissring, M. A.; Tang, W.-J. ; Charron, M. J.; Seeliger, M. A.; Saghatelian, A.; Liu, D. R. Nature 511, 94-98 (2014). PDF, Supp This work was featured in the Boston Globe, Nature News, Nat. Endocrinol., Cell Metabolism, C&E News, the MIT Technology Review, Endocrine News, Healthline, and other media outlets. 101. Electrophilic activity-based RNA probes reveal a self-alkylating RNA for RNA labeling. Chen, Z. and Liu, D. R. in Sequence-Controlled Polymers, ed. J. F. Lutz (Wiley) (2017). Lichtor, P. A.; Chen, Z.; Elowe, N. H.; Chen, J. C.; Liu, D. R. Nat. Chem. Biol. PDF (2018). Maianti, J. P.; Tan, G. A.; Vetere, A.; Welsh, A.; Wagner, B. K.; Seeliger, M. A.; Liu, D. R. in press (2018). Roth, T. B.; Woolston, B. M.; Stephanopoulos, G.; Liu, D. R. ACS Synthetic Biology. in press (2019). Huang, T. P.; Zhao, K. T.; Miller, S. M.; Gaudelli, N. M.; Oakes, B. L.; Fellmann, C.; Savage, D. F.; Liu, D. R. Nat. Biotechnol . in press (2019). 158. A High-Throughput Platform to Identify Small-Molecule Inhibitors of CRISPR-Cas9 Maji, B.; Gangopadhyay, S. A.; Lee, M.; Shi, M.; Wu P.; Heler, R.; Mok, B.; Lim, D.; Paul, B.; Dančík, V.; Vetere, A.; Mesleh, M. F.; Marraffini, L. A.; Liu, D. R.; Clemons, P. A.; Wagner, B. K.; Choudhary, A. Cell in press (2019). 159. High-Resolution Specificity Profiling and Off-Target Prediction for Site-Specific DNA Recombinases. Bessen, J. L.; Afeyan, L. K.; Dančík, C.; Koblan, L. W.; Thompson, D. B.; Leichner, C.; Clemons, P. A.; Liu, D. R. Commun. in press (2019). 160. Development of hRad51-Cas9 Nickase Fusions that Mediate HDR Without Double-Stranded Breaks. Rees, H. A.; Yeh, W.-H.,; Liu, D. R. Commun. in press (2019). 161. An Anionic Human Protein that Mediates Potent Cationic Liposome Delivery of Genome Editing Proteins into Mammalian Cells. submitted (2019).